View towards Grimspound from the path up Hookney Tor | Flickr - Photo Sharing! 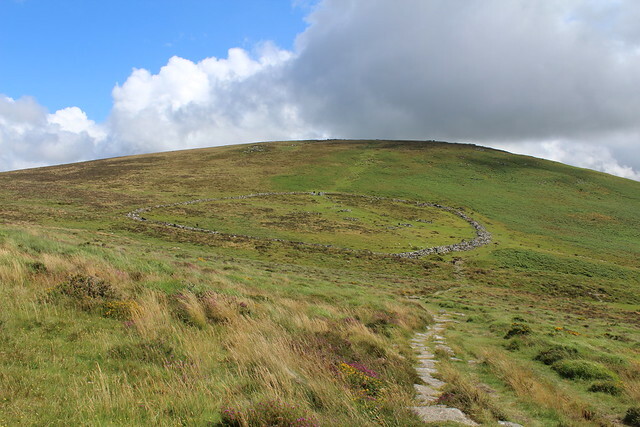 Grimspound is one of the best known prehistoric settlements on Dartmoor, probably dating from the Late Bronze Age (about 1450–700 BC). The remains of 24 houses enclosed within a stone wall, and further houses outside the enclosure, lie in a fold in the hills about 450 metres (1,500 feet) above sea level, between Hookney and Hameldown tors.